The non destructive ultrasonic testing of spot welds has been applied in the automotive industry for many years. 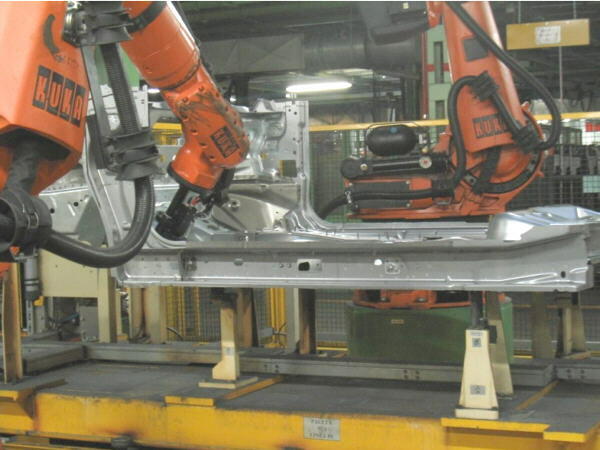 Although the welds in these factories are made by controlled robots, their inspection is still being done manually and for a limited number of welds. When a defective weld is found it usually means throwing away a large quantity of material already welded. There is a need for an automated system with which to check at least 70% of the welds made and the welding parameters in 100% of the robots in the weld cells, and which can be totally integrated within the working cycles already in place. The system needs to be fast enough to be integrated in this environment and robust so it does not force stoppages into the line. By merging developments in ultrasonic and artificial vision we have now a reliable system which can be integrated fully in an automotive plant line and is able to classify welds into groups, depending on what type of weld is found, e.g. : good weld, undersized weld, stick weld, no weld, etc. Spot welding is an economical method for joining metals that is commonly used in car manufacturing plants. The method is adaptable to high speed automation and is under strict cycle times. The plants are usually fully automated and equiped with robotic cells in which different parts of the chassis are built. Typically, a car body contains about 5000 spot welds joining sheets of different thicknesses. The demand for Quality control is ever increasing due to safety requirements and demand for quality. This leads to the need to check the welds are correct in as many points as possible, but current techniques are such that only allow for spot checks and never reach a 100% sampling. Automation plants use two manual methods to check for the quality of the spot welds: the hammer and chisel and manual ultrasound pulse echo inspection. The hammer and chisel method is the eldest one and is a destructive method, where the spot weld is broken, and cannot be performed in a 100 % sampling. It is very laborious and produces test scrap. The faith in the reliability of this method has also suffered due to various findings when welding galvanised steel sheets. The second method started as a complementary method to the first one, but it has quickly become the standard due to its accuracy, speed, repeatability, and the fact that it can be used in all points of the car chassis that are actually welded without producing any scrap metal. This method is not only used for manual testing within the quality assurance, but also for optimizing the welding parameters. There are several publications already on the use of the transit time and echo attenuation of ultrasound signals to determine the presence and estate of a spot weld (references 1, 2 and 4). The current transducers have a rubber tipped, captive water column delay to achieve proper coupling. This membrane is very fragile, bursts easily, and it is difficult to change, therefore hindering any possibility of automation. It is not possible to perform the inspection in-line as it is. In-line inspection can only be done if the process is fully automated. Visual inspection (coloration, smoothness and indentation features) is still needed in some inspections which hinders automation. Having studied the spot weld inspection as it is today and the problems listed above, a new, automatic system has been developed by Tecnitest Ingenieros and Eines S.C.V., called CYCLOPS. This system allows for full automation of the process, eliminating the issues that a manual test introduces and ensuring quality does not impose a limit in the production times. This has been achieved by a combination state of the art of elements, including the use of transducers with special rubber delays, robust but appropriate for ultrasound transmission; the latest artificial vision technology integrated for the location of the spot welds and guidance and positioning of the UT transducer, and a control acquisition and evaluation software package optimised and developed for optimum interpretation of results. 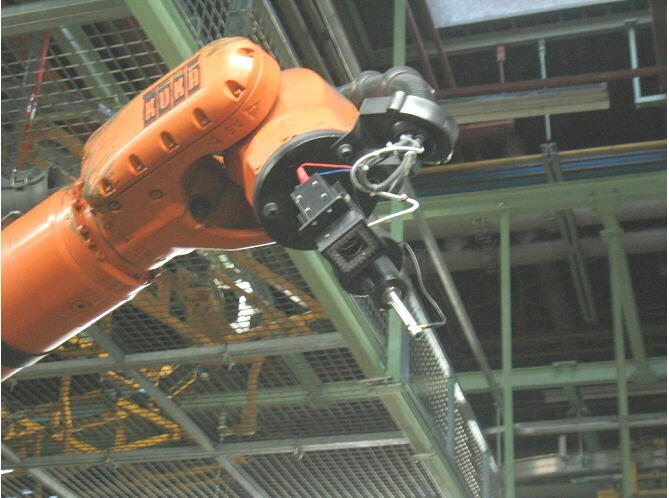 In the production line of a particular component, aided by an industrial manipulator, the sequence of the nominal spot positions is programmed. Each spot position is controlled and each weld inspected and evaluated according to this sequence, with inspection times varying from 3 to 6 seconds and always within the existing cell cycle times. For a given cycle time T and a number of points to be inspected, N, each robot evaluates all the points after 3N/T to 6N/T components (or cycles). In those components where there is no limiting cycle times, the N number of spot welds are inspected after 3N to 6N seconds. On the manipulator's gripper there is a camera and an illumination system attached that evaluates the positioning of the spot welds within the specified tolerances. Additionally, the visual sytem directs the ultrasonic transducer held by the gripper to the centre of each of the spots with high precision. The ultrasonic transducer is fixed to a special holder in the manipulator's gripper that allows for 140 relative orientations of the tool. Once the transducer is touching the surface of the component (dry coupling) at the centre of the spot, the system starts sweeping through all the possible orientations until the UT signal obtained allows for the proper evaluation of the weld. The sweep is stopped when a good UT signal is obtained. burnt weld The results from the evaluation are added automatically (in real-time) into a data base, which includes history records for each spot inspected and general statistics for the whole process. When the component carries different types of spot welds, the UT system's parameters are adjusted automatically for each one (after pre-programming of the corresponding locations). Application Software: weld spot position sequence programming, weld position evaluation, ultrasonic spot weld inspection and evaluation, statistics, and data base. The ultrasonic test method for checking spot welds has proved to be indispensable in the classification of welds and in optimising the parameters of welding machines for series production. One step forward is taken when automating this inspection in the CYCLOPS system, where both the testing of the welds and the optimisation of the parameters are incorporated into the line, always within the plant cycle times. This new and complete ultrasound inspection system has the same reliability as the ultrasonic manual method but it adds all the advantages of an automated solution. Further development is being carried out at the time of writing this paper, with a system installed and being tested in production. Different case studies are also under development. "Ultrasonic testing as a means for quality assurance in resistance spot welding". H. Polrolniczak, Moers. "Metals Handbook", tenth edition, vol. II, ASM International. "Ultrasonic examination of resistance spot welds". A. B. Doyum, M. Sonat, Dept. of Mechanical Eng., Middle East Technical University, Ankara.